Why Digital Skills Matter – For Every Teacher! Last Monday Team TeachPitch proudly introduced its Digital Skills Course to all teachers on the platform. In this short post we explain our reasons why Digital Skills are important in Education and why the time is now for all educators to become more digitally aware. What is TeachPitch doing to improve Teachers Digital Literacy? At TeachPitch we first want to make sure that teachers have the ability to thoroughly increase their digital skills and our Certified Online Tutoring Program is our first official attempt of doing so. an extensive Digital Skills Course consisting of 13 webinars. the possibility for program participants to share what they learn, as they will be provided the opportunity to offer their online tutoring services on TeachPitch – to train other teachers on the platform and work with a wide range of students that came to us through our B2B partnerships or to the platform directly. access to the best digital classroom technology. In order to join, each candidate needs to undergo an interview and test so we have a clear idea of who they are and how we can best help them. All accepted candidates will receive an official certificate created together with the team at the Open University – all certificates will be stored and managed from the Blockchain so all our digital teachers will be able to use this document for possible further career advancement in a rapidly advancing tech world. We sincerely hope that through our program teachers will become digital leaders who can solidly prepare their students for the future. Ever since the introduction of this program we have been fortunate to have over 400 teachers from over 50 countries who registered their interest to join! What are digital skills and why do you feel they are important for teachers today? Digital literacy has become almost mandatory in today’s world where everyone is connected technologically – all the time. We live in the fourth industrial revolution which, because of the very high level of sharing, impacts all sectors. Nevertheless the educational system seems to be lagging behind in integrating these technologies and preparing their pupils for this new world. Making students employable is a driving factor for schools, for this reason developing digital skills is crucial. 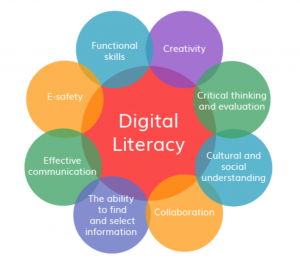 Digital literacy doesn’t mean IT proficiency, in fact they’re completely separate. To us Digital literacy = digital tool knowledge + critical thinking + social engagement ( from USC Rossier’s online mat program ). Meaning critical thinking skills, an awareness of the standards of behaviour in certain online environments, and a better understanding of the social issues created by such technologies. How can the clash between old vs new methods of teaching in classrooms be evident today? In the last 25 years teachers have seen little change in their classrooms. In the main it has been limited to whiteboards and blackboards becoming digitised and replacing more conventional tools like video cassette decks and tape recorders. Much of what teachers deliver is very similar to the materials that were used several years ago. Nevertheless the students have changed, their level of digital literacy has increased drastically in the last decade where they can manage to access the internet and navigate through a range of apps or social media platforms. Hence when teachers step up to the whiteboard, students are expected to give their full attention to this physical world, something which they may not be adept or trained in doing so. The result is the lack of attention due to digital distraction which most teachers are fighting against in classrooms everyday. Teacher attempts to ban the use of digital devices has seen little effect as to this day a student may have a laptop, smartphone, Ipad or a wearable device that they continuously use. Trying to block this wave of technological revolution is not only unproductive but further increases the gap between teachers, their classrooms and the realities of a regular student. Hence it is crucial that we start to think of how we can provide teachers with a set of skills that can work within this context, and exploit the possibility of working hand in hand with this digital and physical reality which students inhabit. So what can be done? Engage Teachers – Case studies, videos, training and webinar sessions can all be used to improve teachers digital literacy. Engage the Pupils – Encourage students to voice their views and concerns through these digital platforms and build a productive student-teacher partnership in a digital environment. Create Modern Classrooms – employing methods such as collaborative learning, student-led learning, and flipped classrooms. Make Lessons Digital – embracing educational software that helps pupils become engaged in the art of learning online. As always, please feel free to send us an e-mail at info@teachpitch.com to share your thoughts and ideas. Hi there, I am an Oxford University Law graduate and a qualified non-practising barrister and occasional tutor of Maths and English. I would be very much like to take part in your series of edtech webinars for teachers.